Well for something that was billed as an unusual weather feature the dust haze is definitely hanging around. 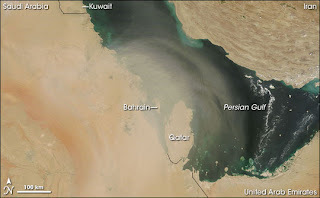 Judging from the weather forecast it'll be here well into the week too; Wednesday is billed as "DUST HAZE THICK AT FIRST WITH RISING SAND IN PLACES DURING THE DAY" according to the local Met Office (Piccie is from space during similar weather in 2007). Drove south to look at the desert today... mostly a super new road (think UK motorway without any traffic) not on our map. We tried the old road to Dur where the ferries leave for the Hawar Islands but it stopped abruptly at the expanding desalination plant. In the haze we failed to find the rest of it so gave up and continued via the new one down to Durrat Al Bahrain, 13 new islands being created at the southern tip of Bahrain. It's billed as urban living, island style with villas, marina and a golf course. This is a mammoth construction project costing billions of dollars. There are a few completed villas so far, mostly white rock and gray dust and security wouldn't let us access the road leading to the islands. Planned for completion last year this is still very much work in progress, much like the Amwaj Islands located at the other end of the Kingdom, north of the airport, Durrat will probably be a brilliant place once its completed. At Amwaj the housing is mostly built but the shopping mall and other facilities are apparently way behind schedule. Both locations look like given a few more years they could be fantastic places to live with villas complexes surrounded by shallow blue lagoons and each home opening onto their own beach or pontoon. Just needs a few shops & restuarants so we decided not to rent at Amwaj... yet. We still haven't got into the swing of life here, partly because we are hotel-bound. Eating lunch around 1pm and then trying to go window shopping just doesn't work. Everything commercial shuts between 1pm and 4pm re-opening just as we feel that hot and dusty, its time for a snooze followed by a pre-supper shower. You can't have a late, lazy weekend breakfast in the hotel either. We resorted to brunching on "biriyani" Turkish style today - a large plate of rice topped by grilled meat or fish accompanied by a mountain of chopped salad, a vast pitta bread plus a dish of hoummous. Cost under £7.00 for two but I really need some proper veggies and don't think I can face eating any more rice for days, even Kevin is ordering salad! Roll on having our own apartment and being able to cook for ourselves. Meals are very carb oriented - last night king size portions respectively of Singapore noodles and rice accompanied our meat and fish selections. And the night before wasn't much of an improvement.... we'll be rolly-polly's soon if this keeps up. As Bahrain is very much a multi-cultural society food is hugely varied but it adds to the adventure. A local grill serves a mix of Indian and Oriental (their word not mine) food so you can have spring rolls and curry. Its all good quality and we haven't been disappointed yet. Most of the cheap cafes offer a cosmopolitan mix of Mediterranean meza, grilled meat and curry. In the more up-market restaurants you can find a good steak or Thai food whilst our hotel reputedly has a Michelin star chef serving classic French dishes.